Joe Satriani: "New band sounds like early Zeppelin"
But he's adamant about one thing: that silly name. In his view, nobody should get too used to calling the band Chickenfoot. "We just had to call it something for the time being," he says. "It's definitely not going to be Chickenfoot. I guarantee it." Having just wrapped the first leg of a world tour (which saw one-time Satriani bassist Stu Hamm filling in for Brad Russell, who had to bail due to scheduling conflicts) Satch and 'Chickenfoot' are hitting the studio this week to begin recording an album that will be out early next year. Already there's been considerable buzz about the project, much of it brought on by some controversial comments from Sammy Hagar, in which he asserted, among other things, that the band "could rival Led Zeppelin." Despite admitting to a certain Zeppelin rush to the music, Satriani categorically denies that Hagar made such statements. "I can't imagine Sam saying anything like that," he says. "I think it was just twisted." 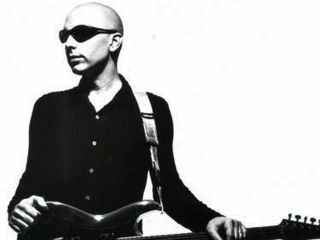 Recently, Joe Satriani sat down for his second interview with MusicRadar this year. In addition to the new band, he was eager to discuss his new 'Black Dog' guitar, Ibanez's faithful recreation of the axe he played in the late '80s and early '90s. "There's so much going on with me right now," he says. "So much to do, so much to talk about. I'm just trying to keep it all together right now."